III. What does this mean in regard to 6 VDC to 12 VDC conversions? IV. How does this affect heater blower motors? A common modification in early trucks is the conversion of the original 6 VDC system over to 12 VDC. Often this causes some confusion to the oletrucker who is not familiar with the principles of DC electricity and current flow. The easiest analogy is to compare the flow of current to that of water flowing through a garden hose. The flow of current is similar to the flow of the water through the hose, the voltage is similar to water pressure, and the resistance is like the diameter of the hose that the water is flowing through. For a given diameter garden hose if you increase the water pressure (i.e. raise the voltage), you increase the water flow (increase the current). If, on the other hand you kept the water pressure the same but decreased the diameter of the garden hose (increasing the resistance), you would reduce the water flow (reduce the current). So we cut our current requirements in half while still maintaining the 60 Watts in power that we needed to operate the vehicle. This is one reason why automobile manufacturers changed from 6 VDC to 12 VDC. The reduced current demand of the 12 V system allows them to use a smaller gage of wire which is both cheaper and easier to work with. The above statement regarding half the current would only be true assuming that all 6V devices (heater motors and light bulbs) were replaced with 12V equivalents. If you are using the old 6V device in conjunction with a voltage reducer then the affected circuit would actually use twice the power that you did before because the device still uses the same amount of power plus you have a voltage reducer dropping the other 6V from the 12V system. The circuit below (Fig. 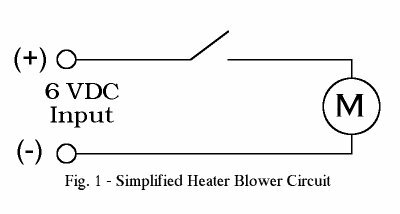 1) is a simplified schematic of the heater blower circuit in a truck equipped with a 6V system. When the switch is closed, the motor begins to operate and draws 1 amp of current (hypothetical value). Since there are no other devices in series with the motor in this circuit, the entire 6 V supply will be applied across the motor terminals. With this information we can calculated the effective load resistance of the motor using Ohm's Law from above. Now we know that our motor presents a 6 ohm load to the supply voltage. We can also figure out how much power our motor uses from this information. For this calculation we use Watt's Law. So our motor uses 6 Watts of power under normal operation. 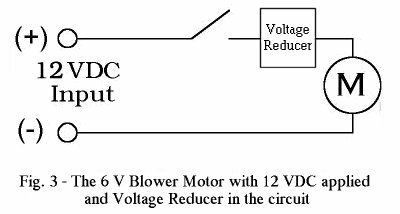 Suppose we convert to a 12 VDC system without making any modifications to the blower motor circuit. This would result in the the circuit shown below (Fig. 2). So we find under these circumstances that we are drawing twice the current we would under normal circumstances and dissipating 4 times the power!! The motor would quickly fail unless something is added to the circuit to bring it back into normal operating parameters. That something is what is commonly called the voltage reducer. In actuality it is nothing more than a resistor which is designed to have a voltage drop across it of 6 VDC. 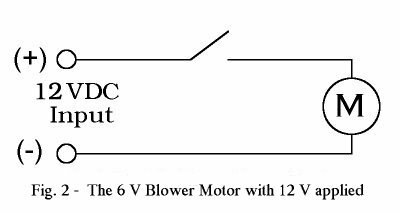 The schematic below illustrates the same blower motor circuit with a voltage reducer installed. Now that we have installed the voltage reducer with it's 6 V drop the other 6 Volts is dropped across the motor. Note that the voltage reducer must have the same resistance value as the effective resistance of the motor in order to drop the voltage to the required 6 VDC. The motor is now operating at the voltage and current it was designed for while the reducer dissipates the remaining power in the circuit.